We are very pleased to report that Moss & Barnett has once again been named a “Best Law Firm by U.S. News – Best Lawyers. The 2017 “Best Law Firms” list reflects the high level of respect that a firm has earned among other leading lawyers and clients in the same communities and in the same practice areas for their expertise, professionalism, and integrity. The rankings are based on a rigorous evaluation process that includes the collection of client and lawyer evaluations, peer review from leading attorneys in their field, and a review of additional information provided by law firms as part of the formal submission process. Clients were asked to provide feedback on firm practice groups concerning expertise, responsiveness, understanding of the business and its needs, cost effectiveness, civility, and whether they would refer another client to the firm. Attorneys also voted on expertise, responsiveness, integrity, cost effectiveness, whether they would refer a matter to the firm, and whether they consider the firm a worthy competitor. 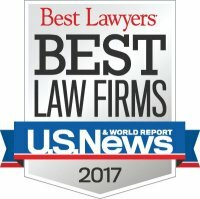 The U.S. News – Best Lawyers® “Best Law Firms” rankings are based on a rigorous evaluation process that includes the collection of client and lawyer evaluations, peer review from leading attorneys in their field, and review of additional information provided by law firms as part of the formal submission process. To be eligible for a ranking, a law firm must have at least one lawyer listed in the 22nd Edition of The Best Lawyers in America©list for that particular location and specialty.